The International Forum on Post Conflict Education “Learning to Live Together” was held in the State Residence “Ala - Archa”, Bishkek, Kyrgyzstan from 27 to 29 June 2012. 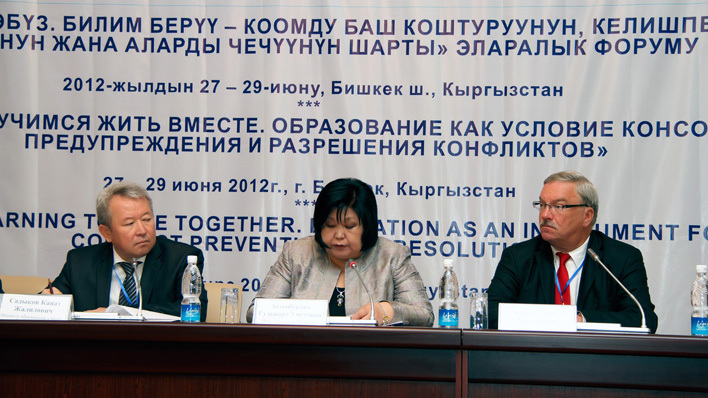 The UNESCO Cluster Office in Almaty in close cooperation with the Kyrgyz National Commission for UNESCO, UN Women Sub-Regional Office for Eastern Europe and Central Asia in Almaty, and Soros Foundation in Kyrgyzstan organized the Forum. The idea of the Forum was formulated during the visit of the former Kyrgyzstan President Roza Otunbaeva to UNESCO and her discussion with the Director General Irina Bokova. The Forum aimed to support education initiatives and collect good practices in the context of disaster and conflict prevention in Central Asian and CIS countries. The Forum provided the opportunity for policymakers, experts and practitioners to identify debate and discuss priority issues in different areas of post conflict education; the Forum provided a platform for networking, collaboration and seeking common solutions to problems arising in post conflict situations. The participation of EURASEC Member State Education Ministers underlined the importance of the Forum theme and promoted implementation of joint initiatives and events for the achievement of quality education for all. The Forum partners provided very competent and knowledgeable experts and resource persons from Russia, Ukraine, Moldova, South Korea, Germany, Philippines and Costa Rica, who supported very dynamic and interesting discussions in the plenary and working sessions. More than 100 participants registered and participated in the work of the Forum. Participating countries included Kazakhstan, Kyrgyzstan, Tajikistan and Uzbekistan. The welcome ceremony was opened by high level government officials and representatives of UN and international organizations. Mrs. Asymbekova, Vice Prime Minister of the Kyrgyz Republic greeted the gathering on behalf of the Government of the Kyrgyz Republic. She pointed out the importance and timeliness of UN initiatives, especially those of UNESCO and international donors to prevent, prepare and respond to emergencies. Mr. Sadykov, Minister of Education and Science was pleased to welcome country delegations and all participants to Kyrgyzstan. The Minister recognized that conflict prevention should start at the earliest stage and stressed the importance of creating a safe and peaceful school climate in order to learn to live together. 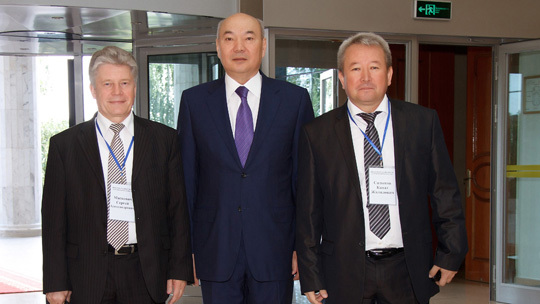 Mr. Sadykov conveyed his sincere appreciation and wished participants success in achieving goals of the Forum. Mr. Lazarev, Director of the UNESCO Almaty Cluster Office welcomed the distinguished participants on behalf of UNESCO Director General Irina Bokova. In his opening speech he stressed that education is the main instrument of peacebuilding, based on tolerance, mutual respect and adherence to dialogue. Countries should follow a path of the mutual trust between citizens and this work must start at the school level. Mr. Lazarev urged that international organizations, governments, non-government organizations, civil society, experts and parents should all play a more active role in education system development in our countries. 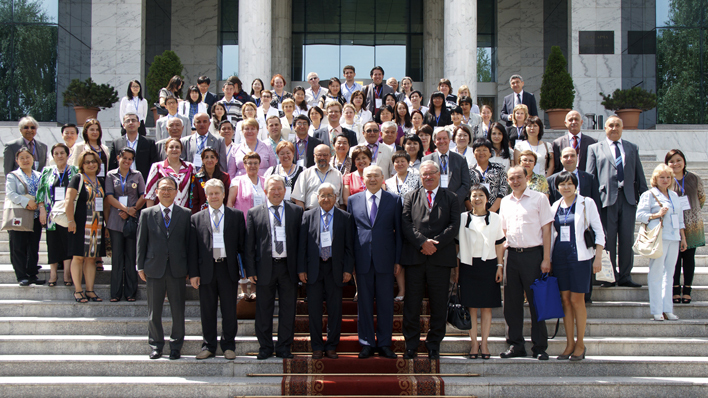 High level representation from Central Asian and CIS Member States included Ministers and Vice-Ministers of Education. The Ministers noted in their speeches that they accepted with pleasure the invitation to take part in such important event and highly appreciated the significance of the topics for the cluster countries. In their speeches the Ministers stressed the important role of education, value of tolerance and building a culture of peace through education. Mr. Singh, the United Nations Special Rapporteur on the Right to Education in his welcome speech stressed the importance attached to the key role of the right to education in creating a culture of peace in promoting human rights and democracy, respecting fully the ideals, values and principles enshrined in the United Nations Charter. Moreover, in his speech he emphasized that social cohesion and quality education are in fact central to the normative framework for the right to education which is universal and does not permit any discrimination or exclusion. All speakers expressed hope for professional dialogue between policy makers, educators and teachers and that the results of the discussion should be reflected in the final Forum documents. During the three day forum, plenary presentations and discussion focused on the following themes: the role of education in conflict prevention and resolution: basic approaches in international practice; education policy priorities and measures for conflict prevention and resolution; goals and priority lines of technical and financial support in post-conflict situations; international experience in education for conflict prevention and fostering tolerance in society; education policy priorities and measures for conflict prevention and resolution. In addition, Forum participants had the opportunity to work in depth and express their concerns during the work of three thematic groups: education as an instrument of social cohesion, prevention, and conflict resolution; gender responsive approaches in education for conflict prevention; and the role of social Inclusion in promoting peace and stability. The draft final document touched upon the following topics: education policy, including issues on budget policy, administrative and staff policy, capacity development first of all for teachers (pre - service and in-service), capacity development including for state/government officials; trainings for statisticians, and journalists; establishment of the Central-Asian resource Centre. The Forum atmosphere cultivated sincere discussions and genuine involvement of all participants. The Forum was a joint activity, demonstrating good cooperation of many organizations from different regions, including UN agencies such as UNESCO, UN Women as well as Soros Foundation and organizations from the Asia and Pacific region. Representatives of country delegations and invited resource persons highly appreciated the intensive work of the Forum. Participants thanked organizers for providing a very good platform for detailed discussions and giving the opportunity to meet experienced and competent people. The UNESCO Cluster Office in Almaty is planning to publish theses of the reports and organize follow up meetings and trainings for policy makers from Central Asia to identify plan of actions and implement Forum recommendations.